PISO FARE friends, we have the Air Asia Red Hot Sale 2017 to 2018 details on the covered destinations and promo fare ticket rates! The Air Asia Red Hot Sale 2017 to 2018 are now open for booking until November 20, 2017. Promo tickets from this sale are good for travel from May 1, 2017 to February 6, 2018. As for the Air Asia promo deals 2016 to 2017, selling period is until November 27, 2016 while cheap tickets can be used for November 14, 2016 to April 30, 2017 trips. 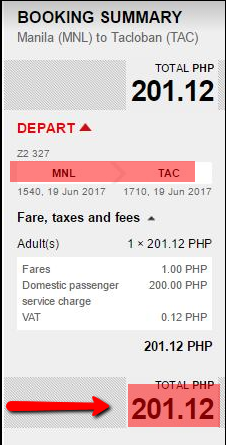 The domestic sale tickets as low as P202 is actually a PISO FARE: base fare is P1 + terminal fee of P200 + VAT of P.12. 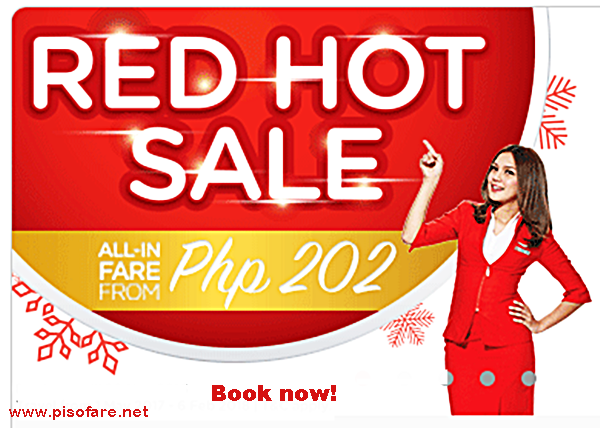 Air Asia Red Hot sale tickets are available on selected dates only. We did online booking to prove the availability of Air Asia red hot sale tickets and shared it below. Here is another sample of ticket booking. This is an international sale ticket Manila to Hongkong. The Air Asia quoted promo tickets are good for one-way trip. Book your Air Asia red hot promo fare via www.airasia.com. Payment Centers- SM Sore, EC Pay, 7 Eleven, Robinsons Store, Cebuana Lhuillier Bayad Center and Payment Partners and M Lhuiller. If you don’t like to pay additional charges when booking the Air Asia Red seat sale, use the DragonPay Payment Facility when paying the Red Hot Sale tickets 2017 to 2018 or the Air Asia Promo Deals 2016 to 2017. Plan your trip in advance. Make also a back-up plan. In case your first plan will not work, then proceed to 2nd plan. Be ready with the travel details: destinations, travel dates, names and birthdates of passengers to facilitate your booking process. When the “Waiting Room” show many times, you may log-in to mobile.airasia.com. You may also use the AirAsia Mobile App to book your tickets. Read HERE for more info on the app. When booking, secure your flights first. If you decide to get a checked baggage allowance or pick your preferred seat, you do this up to 4 hours prior to your departure schedule. In case your search will take too long, you will be directed to the “Waiting Room. Do not refresh your browser when you are there or your search will be going to a new “Waiting Room”. Be armed with a lot of patience when booking. The Air Asia Red Hot Sale 2017 to 2018 and the Air Asia promo fare 2016 to 2017 are LIMITED. Sale seats are on a FIRST COME, FIRST SERVE BASIS so book fast if you are aiming get the best Air Asia promo fare tickets 2017 to 2018! For more promo fares and PISO FARES of Air Asia, Cebu Pacific, PAL and other airlines, LIKE and FOLLOW us on Facebook at PISO FARE TICKETS!! !